Annual subscription includes: Monthly copies of Customer Communicator and SkillSharpener. Web Extras. Thank You Kit (a $79.95 value). Minimum order of 10 copies for discount. With Customer Communicator you can be sure your staff has the skills, motivation, and positive attitude needed to serve every customer with poise and professionalism. Every month, each of your reps receives their own copy of Customer Communicator. Each issue includes information they can use right away to improve their phone skills, handle difficult customers, listen effectively, handle stress, manage their time, and more. 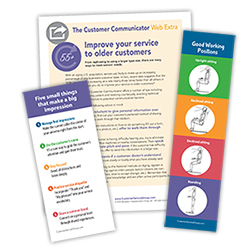 Your staff will read Customer Communicator right at their desks, at convenient times, and at their own pace. Then, they’ll download the monthly Web Extras. These include articles, checklists, reminder cards, and more. Each month you’ll also receive your manager’s copy of SkillSharpener. It’s a high-level view of what your team will be reading in the current issue of Customer Communicator. You’ll also find links to additional management-level material just for you. Each issue of Customer Communicator and SkillSharpener includes links to additional resources at the Customer Service Group website — from articles to checklists to print and use forms, Web Extras are a valuable addition to this training and motivation service. With your subscription, you’ll receive our exclusive Thank You Kit. It includes everything you need for on the spot recognition. 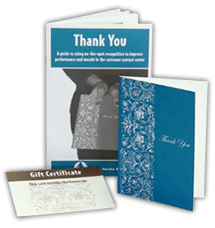 Your kit includes a recognition guide, 25 high-quality thank you cards, 25 blank certificates, and a recognition log. 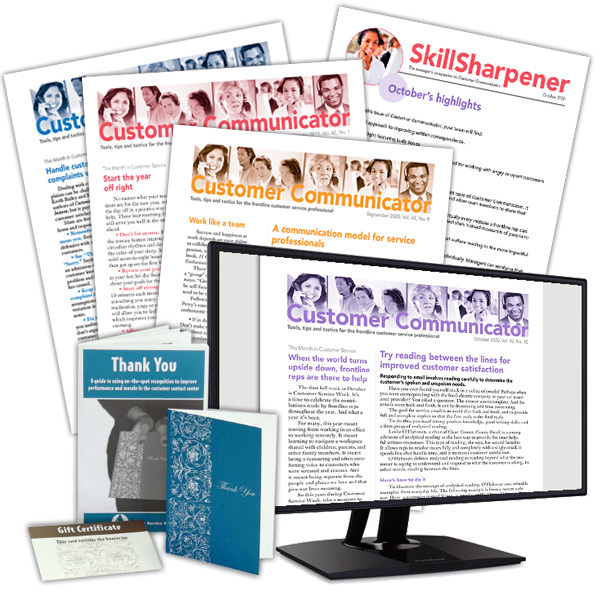 The Thank You Kit is sold separately for $79.95 but it is yours free with your subscription to Customer Communicator.